Tropical Storm Darby is currently centered over 475 miles southwest of Manzanillo, Mexico. Darby had maximum sustained winds of 65 mph with gusts to 85 mph. Thunderstorm activity associated with the system continued to increase Tuesday afternoon, a sign that the storm is intensifying. This intensification will continue in the coming days as the system progresses to the west-northwest, though it will bring no direct impacts to land through early next week. 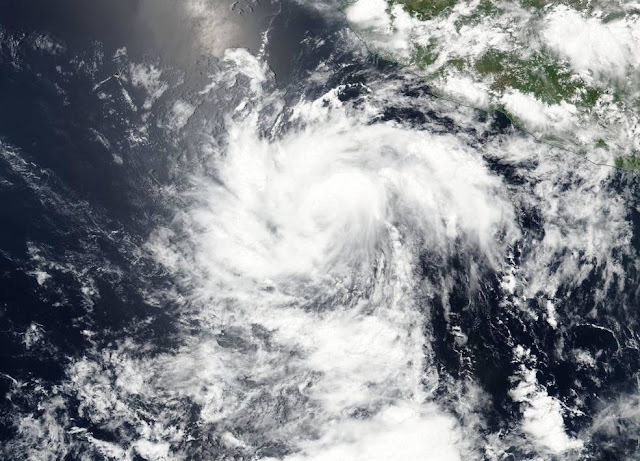 Tropical Depression 4 formed around 5 p.m. EDT off the coast of western Mexico on Monday, July 11, Accu weather. The VIIRS image showed thunderstorms around the center of circulation, and bands of thunderstorms wrapping into the low level center from the western and eastern quadrants.Soon after it formed the Visible Infrared Imaging Radiometer Suite (VIIRS) instrument aboard NASA-NOAA-DOD's Suomi NPP satellite captured a visible light image of the storm. The depression continued to organize overnight, and by 11 a.m. EDT on July 12, the depression had become a tropical storm. Forecaster Berg at the National Hurricane Center said "Recent microwave data indicate that the depression has a well-defined circulation with the center located to the northeast of the strongest convection, NASA.